Start 2019 in the Fresh 2017 Nissan Altima! For a midsize car that curvy, handsome, and upscale, look no further than the Nissan Altima, the family-sedan that’s been a favorite ever since its launch a few years ago. The Altima last got an upgrade in 2013, and the features that seemed fresh then look stale now. Although the Altima remains quite unchanged since the last version, but if you seek a quiet and composed ride, then you can’t go wrong with this one. The 2017 Altima comes in five trim levels: base, S, SR, SV, and SL. The different trims are distinguished by engine sizes: 2.5 for the four-cylinder and 3.5 for the V6. Some of the standard features in the base trim are four-way-adjustable front passenger seat, 60/40-split folding rear seats, Bluetooth phone and audio connectivity, a four-speaker sound system with a CD player, and Nissan’s Easy-Fill Tire Alert system that flashes the lights and beeps the horn to indicate tire pressure. The 3.5-liter V6 engine provides 270 horsepower and 251lb feet of torque, which propels the vehicle to 60 mph in only six seconds. 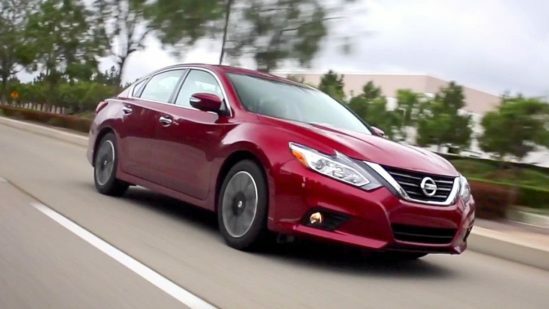 The Altima offers best in class mileage, often better than other midsize sedans. The Altima already had nice interiors, and now it has a stylish center stack and console. The Altima has also added padded door armrests and form-fitting ‘zero gravity’ front buckets that seem comfortable. Some of the standard safety features include antilock brakes, stability and traction control, front-seat side airbags and full-length side curtain airbags. The S, SV, and SL trims also have a rearview camera, blind-spot and rear cross-traffic alert systems. The SL trim also comes with forward collision warning, and crash mitigation systems with automatic emergency braking. In models with the available NissanConnect Services system, there are additional features like automatic collision notification, emergency assistance, and stolen-vehicle location services. The standard 5-inch display of the Altima is small and difficult to read, while the 7-inch upgrade is easier to read but less intuitive than the former. There’s ample trunk space for cargo at 15.4 cubic feet, and the Altima also has a wide and low opening for easy loading and unloading of cargo. Some of the technical features of the Altima include power driver’s seat with lumbar adjustment, a touchscreen audio system with SiriusXM satellite radio, a backup camera, dual-zone automatic climate control, and remote engine start. Visit Yonkers Automall today at 1716 Central Park Avenue in Yonkers to test drive the 2017 Nissan Altima! We are your premier destination for all pre-owned makes and models, and with the best cars and best deals, why would you want to go anywhere else? See you soon!